Only War is a Warhammer 40.000 roleplaying game in which players take on the roles of soldiers in the galaxy-spanning armies of the Imperium, and the Only War beta test is your chance to stand on the front lines of its development! As part of the Only War beta test, you'll provide valuable reconnaissance for the war effort, as you help us to craft the best possible final product. 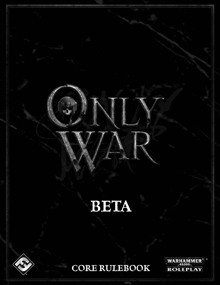 The Only War beta is a complete, 256-page playable version of Only War; the only difference is that it omits certain art pieces and background "flavor" that will be present in the final version. This product has already undergone extensive development, playtesting, and refinement, and we have no doubt that it's ready to provide hours of enjoyment. What's more, Only War beta test participants have an opportunity to experience the game months before they otherwise would!